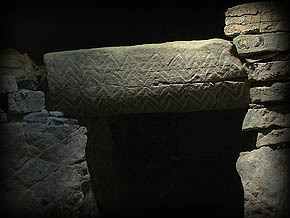 There is always an air of excitement when I pull back the iron door at Fourknocks, without doubt this is one of my favourite passage tombs, after you enter into the darkness the chamber slowly starts to reveal it's wonderful secrets. All around you pieces of neolithic rock art start to appear, although the roof was reconstructed using concrete, holes were left in the dome to allow shafts of daylight to gently display the rock art. 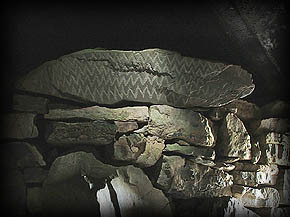 The passage grave dates to 2500-3000 BC. 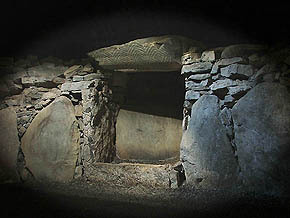 The chamber at Fourknocks is 42 square metres, more than twice the size of the chamber at Newgrange. A post hole was found at the centre of the chamber suggesting that because of the chambers size it may have had a wooden roof, or maybe a roof made of hides, some even suggest there may not have been a roof. 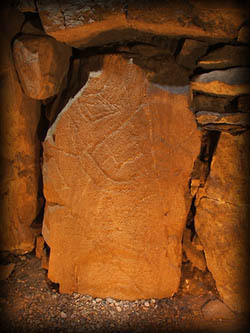 The image right, shows the inscribed stone at the end of the passage on your left as you enter the chamber. On the opposite side of the passage is a beautifully decorated lintel stone, shown left, which originally would have spanned the passage. 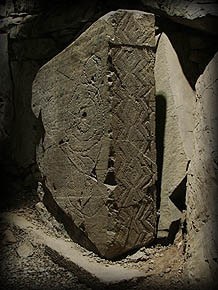 This stone clearly shows the picking method used to form the zig-zag shapes. 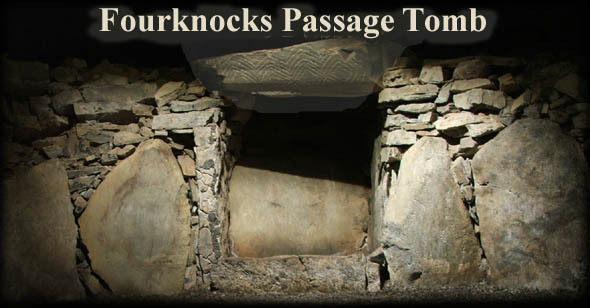 Fournocks is a cruciform passage tomb, consisting of a short passage and a large central chamber with three recesses. There are a total of twelve decorated stones inside the chamber, One of these is halfway up the passage on your left hand side as you enter. The west recess, pictured right, has another decorated lintel stone. There were over sixty burials found in the passage and recesses and more burials were found in the mound. 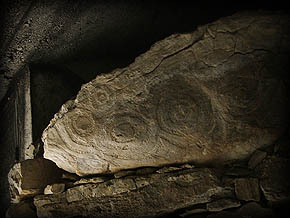 Shown left is a picture of the free standing stone to the left of the chamber as you enter, this stone has a design inscribed which is said to represent a face, the only one we know from this period, but whether it does represent a face is only speculation. Also around Fourknocks are the remains of an ancient burial trench and a cremation trench, but there is no access to these sites. The south recess pictured right, also has a decorated lintel stone. The free standing stone, shown bottom left, also has the zig-zag decoration associated with Fourknocks. I would strongly recommend a visit to Fourknocks, if you do visit close the door on entering and let this mystical site slowly reveal its secrets. Situated: The site can be quite difficult to find from Ardcath as it sadly lacks a few signposts, the best way is from The Naul, Co Meath, the tomb is around a mile NorthWest of here. 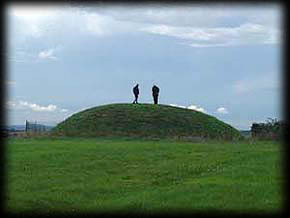 There is a sign at the site telling you to collect a key from Mrs Whites approximately 800 metres away from the tumulus. There is a twenty euro refundable deposit for the key. Discovery Map 43: O 1078 6205. Last visit Mar 05.